Keith Krumwiede is a writer and designer whose work has been widely published and exhibited. He studied at the University of California, Berkeley and the Southern California Institute of Architecture and has taught at Rice University, Yale University and the New Jersey Institute of Technology, where he is currently an associate professor and the director of graduate architecture programs. He is the author of Atlas of Another America: An Architectural Fiction, from Park Books and is currently a visiting associate professor in the Department of Architecture at the Massachusetts Institute of Technology. Masquerading as a historical architectural treatise, Keith Krumwiede’s book Atlas of Another America seamlessly mixes fact and fiction to imagine counterfactual histories of—or, if read forward instead of backward, speculative sociopolitical futures for—the American Dream. 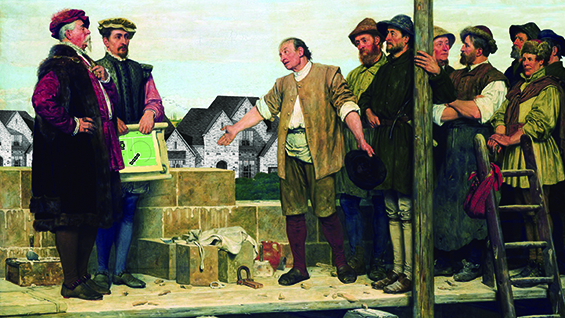 The book’s strangely familiar visions draw on a long lineage of social and architectural thought—including the communitarian longings of Owen and Fourier, the mythic reconstructions of Piranesi, the utopian typologies of Ledoux, the critical hyper-realities of Archizoom’s No-Stop City, and the collaged counter-city of Rem Koolhaas’ Exodus. Through the artful appropriation, exaggeration, and reorganization of found forms, images, and words, Atlas of Another America argues for the value of critical misreadings in advancing architectural thought and action. This event will be held in conjunction with the exhibition "Selections from Atlas of Another America." Copies of the book may be purchased at a discounted price during the span of the exhibition here by submitting "PR20ATLAS" in the promo code field at checkout.